Remember when I promised a classier Christmas movie (AKA one that wasn't from Lifetime or ABC Family)? Well here we go! Joyeux Noel (Merry Christmas)! I wasn't sure what exactly this was about, other than it's about WWI and Christmas, but it was rated really highly for me on Netflix, which makes sense because I have a thing for both Christmas movies and war movies. I started out this post like the other Christmas movies I've done so far, but this movie is way too serious and requires undivided attention. It starts off a little slow, but I promise it gets way better. 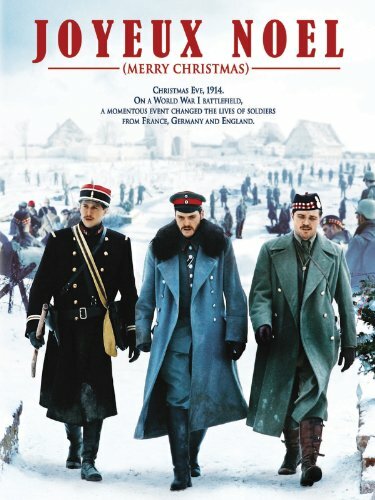 The movie starts at the beginning of World War I (1914) and quickly shows you how everything moved from an excited declaration of war, promising that it'll all be over before Christmas, into a long, disheartening battle. The German, French, and Scottish troops have dug their foxholes on the outskirts of a small French farming area, which is close to home for a few of the French troops. It's really interesting to see WWI from three different perspectives all in one place. And none of them seem particularly biased. There are characters you love and hate on all sides. On Christmas Eve all of the soldiers are hunkered down in their freezing trenches trying to keep their spirits up. You can hear a little bit of celebration coming from the Scottish side (bagpipes, of course!) and then some German singers belt out a tune for their men. Eventually you're going to start bawling when they call a cease fire for the night and all of the troops come out into no-man's land (the area in the middle filled with dead bodies and craters from grenades) and exchange gifts, traditions, stories from home, and even argue about the name of a stray cat that has been making his way to each of the foxholes. Of course, you can't forget years worth of war in one night, but it's amazing to see how everyone still has a little something in common even after you've been told to hate and kill each other for so long. The rest of the movie goes on to show how everyone deals with the next few days, their new friendships, honoring those they've lost, having to go back to fighting, and some of the propaganda used to vilify the opposition. This movie really makes you think about how close everything in Europe really is. These countries are not very large and they're closer to each other than most people in different states are here. Many people had family on both sides of this war, and I think this movie did an amazing job of subtly bringing all of these facts to light. HO HO HO or NO NO NO? This will probably become one of my new favorite Christmas movies. I highly recommend checking this out on Netflix or Amazon. Keep some tissues handy.